Strolls across the Grand Parc ! 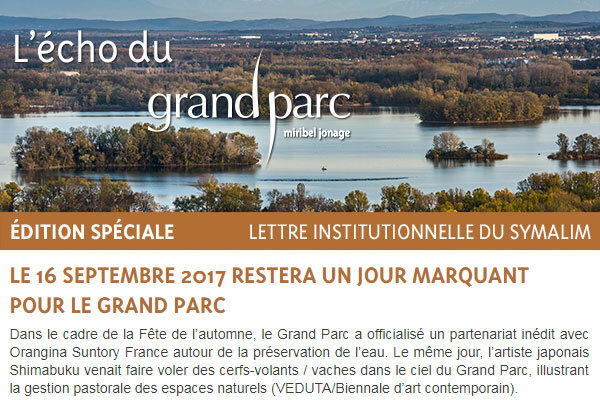 With its 2 200 hectares of nature, the Grand Parc is a perfect place to go for a stroll all the year. On foot in the paths, by mountain bike on the appropriate paths or on the lake of the Eaux Bleues with the Ecopagayeur path (audio guided path on water by canoe), possibilities of trips, alone, with family or friends abound. In the era of the 2.0 generation, with the new digital and mobile tools at our disposal, the Grand Parc wants to give a new dimension to strolls and allows novice and advanced strollers to take a fresh look on the surrounding environment. Hike in a new way, thanks to digital you could lose your way on a mountain bike path "between nature and culture" and a walking trail through "trees from here and elsewhere". Discover with this app natural places that are fitted for strollers while highlighting biodiversity, landscapes and history with several paths "Les Grand Vernes", "Le sentier des hommes, un fleuve et une île" and "Le sentier des Allivoz".